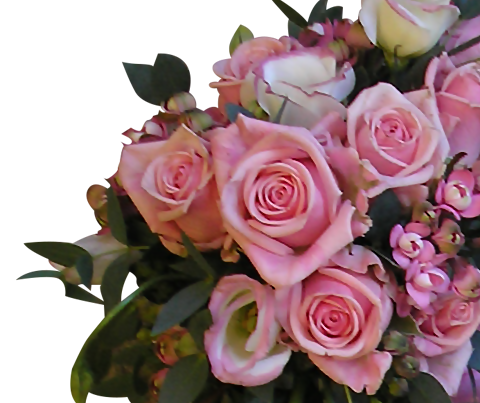 From a simple mixed flower Posy or Spray to a more intricate or complicated design tribute Kaye is able to offer a wide choice. 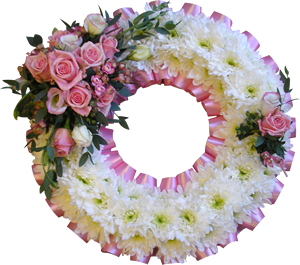 Tributes can be delivered straight to the funeral directors in the local area. You may wish to choose from the gallery & order by telephone or email; alternatively you may wish to contact Kaye to arrange an appointment at her workshop/office to discuss your requirements further. This is also an opportunity to choose a suitable card & write a personal message. Kaye understands that this can be a difficult time and offers total discretion and professionalism. You will never be rushed in to making decisions. This is a guideline only; individual quotes are dependent on flowers chosen. From £30.00, £40.00, £50.00 each. From £50.00, £60.00, £70.00 each. From £150.00, £200.00, £250.00, £300.00 each. Delivery Charges available on request. Thank you so much for the lovely floral tributes you did for me and all of my family for our precious Mum and Grandma… and for the wonderful table decoration I collected from you, for the photo table, the previous day. They are all so gorgeous and so full of flowers... The Gates of Heaven, you made for me, was by far the most gorgeous arrangement I’ve seen. The one I had for my Step-dad, 9 Years ago [before I knew you] was nothing compared to how beautiful you made this for Mum. I cannot thank you enough! Mum had several tributes, by other florists, however, I know I’m biased, but yours were by far the best. I have the table arrangement on my dining room table, and I have to say, each time I look at it, it seems more gorgeous then the time before. I look forward to seeing you again, in the not too distant future, to finalise ‘H’ & ‘R’s wedding flowers, which I know are going to be just stunning, if Mum’s flowers are anything to go by. I just wanted to say an enormous thank you for the beautiful floral tributes that you created for my Father’s funeral... the day went very well and everything was perfect including the flowers. Just wanted to say thank you so very much for the beautiful flowers you did for J’s Grandma. The colours were stunning and I thought it looked amazing. Thank you very much for the photos, flowers and kind wishes. The day went well and it was good to have all the family together as we are so small and far flung. My Aunt was very happy to take the table arrangement so I’m glad I had that after thought. Your interpretation of my thoughts for foliage was perfect and it felt just right for my Dad. My Brother’s and I have what we call ‘the test’ which means meeting what we think are our Aunt’s standards and the fact that she liked it meant it was really a success! I am just writing to say how pleased my Mum and I were with the flowers for my Father’s funeral. They were exactly what we were looking for and all three arrangements represented everything we wanted to say. Being able to visit you in your workshop to discuss our requirements in such a pleasant environment also helped make a sad occasion easier to deal with. Our heartfelt thanks. Thank you so much for the lovely sympathy flowers, they were perfect and looked the best there.